We are excited to be able to participate in this great project again this year. When we learned about all the children not having clean water to drink and girls not being able to go to school so they could collect water for their families, we wanted to help. Our students learned a little about how others get water through this project by carrying the water they use in the classroom the month of November. Please help us help other children have clean water! 11/22/11 Sharon White $10.00 This is a contribution on behalf of my grandaughter, Ryleigh Masterson. Good luck! 11/18/11 Nancy Cressey $25.00 I am so proud Zidon is involved in an awesome project like this - not to mention my wonderful daughter Julie. 11/18/11 Julie Spradling $30.00 This is a wonderful school and a wonderful project! 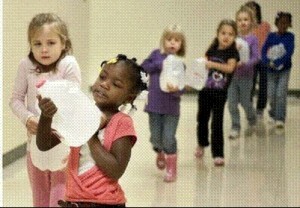 The students are learning so much carrying their own water every day! 11/14/11 Birk and June Hill $50.00 Because we are lucky and thankful for clean water. 11/13/11 SUSAN PIERCE $10.00 Wonderful fundraiser for my grandson to be involed in! Great learning experience for the kids to get the feeling of how it is for other children in the world. 11/13/11 Erin Erb $25.00 So inspired by this project! 11/03/11 Krista Stockman $30.00 So proud of the Bunche students! 10/28/11 Mike and Marilyn Horan $100.00 This project really makes a difference for children and families. We take so many things for granted. What a blessing this project is! We appreciate the opportunity to help! 10/28/11 Brenda Huth $100.00 I am so blessed in so many ways. I see beautiful children every day who have fresh clean water. This is my wish for all of the world's children!